Lying deep in the Los Padres National Forest is a place filled with tranquility, peace and beauty. Tassajara Hot Springs is a Buddhist Monastery that opens their doors to visitors each summer. One can explore the Zen teachings, take part in meditation, guest lectures, hiking, relaxing, and of course hot springs. First enjoyed by the Esselen people for its restorative hot spring waters, Tassajara became a resort before the turn of the century and painted a colorful history along the way. In 1966 Shunryu Suzuki founded the Monastery. Now Tassajara devotes itself during the winter months to practice and welcomes visitors in the summer to rejuvenate, clear their minds and find a little Zen themselves. Step into the epitome of peace at this off the grid retreat for the soul. There is limited electricity, which Tassajara produces themselves, no internet or cell phone reception. There is one public phone available if needed. Kerosene lanterns light your way after sunset and add a quiet ambiance to your experience. The natural hot spring Japanese-style bathhouses are divided into a men’s and women’s areas, which are clothing optional spaces. Each has communal showers, two hot plunges, steam room, private bath and sundeck with creek access. The men’s side is co-ed in the evenings. After your soak take a swim in the pool and enjoy gourmet vegetarian meals which are provided for overnight guests. Tassajara Zen Mountain Center asks that visitors support their monastic ways by wearing appropriate clothing around the grounds and in dining areas. Please remove your shoes when entering guest rooms and meditation halls. After you’re done hiking and relaxing in the hot springs, take in a game of Bocce Ball. If you’re looking for something bit quieter, browse the library, leaf through the history albums or take in a Dharma talk. Rustic, simple, and beautiful. Choose from a variety of eclectic cabins and rooms, or stay dormitory style. Retreat participants have the option for cabins or rooms as well. 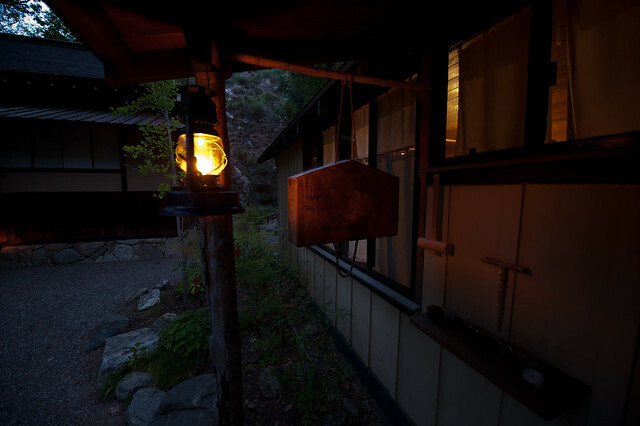 The cabins and rooms do not have electricity, but kerosene lanterns are provided to light your night-times. Most cabins have a private sink and toilet. Shower facilities are located in the bathhouses. Drink in gorgeous views of mountains, creeks and Redwoods. Let the experience at Tassajara Hot Springs Zen Mountain Center engulf your being with complete rejuvenation. Full use of the facilities and three daily meals are included in your accommodation fee. From Carmel, follow Carmel Valley Road/Co Road G16 roughly 6 miles to Tassajara Road, then turn right. Expect approximately 14 miles of winding, dirt, steep mountainous driving once you’ve left the pavement, to reach your destination. Not all automatic vehicles can safely navigate this road. Four-wheel drive is HIGHLY recommended. Fortunately, Tassajara Retreat offers a shuttle for their guests that picks up in Jamesburg. The “Stage” has a morning and afternoon pickup and costs $55.